Abstract: Gabbroic bodies from the Moldanubian Monotonous Group (Mariz) and the Moravian Vratenin Unit (other sites), often showing retrogressive recrystallization at their margins in the amphibolite-facies grade, have norite, gabbronorite, gabbro and hornblendite compositions. Gabbros with preserved coronitic textures are limited to the Vratenin Unit. The estimated equilibration temperatures derived from plagioclase–amphibole pairs and orthopyroxene Ca contents calculated for pressures 5–10 kbar overlap for coronitic (700–840 °C) and non-coronitic gabbroic rocks (680–850 °C). Although the Moldanubian (Mariz) gabbroic rocks are more Mg-rich compared to the Moravian gabbroids, they show crust-like La/Nb ratios of 2.1–6.6 characteristic of subduction-related magmatic rocks coupled with uniform low eNd values of +0.6 to +0.7. Apparent subduction-related features are probably caused by contamination by juvenile crust and/or by metamorphic fluid rich in incompatible elements during the Variscan metamorphism. Samples from Korolupy–Nonndorf and Mesovice have La/Nb ratios <1.7 and show negative correlations between La/Nb and eNd. Such decoupling between La/Nb and eNd could be attributed to contamination of the subduction-related parent magma by crustal material with higher La/Nb and lower eNd values. Samples from Uhercice show ambiguous geochemical patterns inherited from contamination by very old recycled material. Gabbroic rocks from Mariz should represent an underplated, partly layered cumulate body of continental tholeiite composition, strongly influenced by crustal contamination. In contrast, gabbroic bodies from the Vratenin Unit, having a close spatial relationship to the surrounding garnet amphibolites, were emplaced into a lithologically variable passive margin sequence probably during the Cadomian extension. Abstract: Middle Eocene hemipelagic marls from the Pazin-Trieste Basin, a foreland basin of the Croatian Dinarides, display repetitive alternations of two types of marls with different resistance to weathering. This study focuses on the chemical composition, stable isotopes, and palynomorph content of these marls in order to better understand the nature of their cyclic deposition and to identify possible paleoenvironmental drivers responsible for their formation. The less resistant marls (LRM) have consistently lower carbonate content, lower δ18O and δ13C values, and more abundant dinoflagellate cysts than the more resistant marls (MRM). We interpret these differences between the two marl types to be a result of climatic variations, likely related to Milankovitch oscillations. Periods with wetter climate, associated with increased continental runoff, detrital and nutrient influx produced the LRM. Higher nutrient supply sparked higher dinoflagellate productivity during these times, while reduced salinity and stratification of the water column may have hampered the productivity of calcareous nannoplankton and/or planktonic foraminifera. In contrast, the MRM formed during dryer periods which favoured higher carbonate accumulation rates. This study provides new information about the sedimentary record of short-scale climate variations reflected in wet-dry cycles during an overall warm, greenhouse Earth. Abstract: This article deals with the dynamics of the deep-water gravity flows sedimentation within the Magura Formation. This investigation is based on analysis of the Magura sandstone sedimentary structures studied on the outcrops. The final comparison of the sedimentary structures and cycles with the paleocurrent directions provided an interpretation of the gravity flows dynamics and helped to restore the migration of the sandy lobes in space and time. Three modes of sedimentation are recorded: regular cyclic sedimentation from the lobe, irregular sedimentation from the immature lobe and pelitic sedimentation on the basin plane without the lobe influence. We compared the occurrence of some sedimentary structures with the changes of the current directions and bed thickness. The following interpretations of gravity flow fan dynamics are results of this comparision: the fan consists of one or several lobes, the lobe branches out into branches with the radial current arrangement, the lobes laterally change position and the lobes suddenly die out. Abstract: This study investigates the chronology of paleostress evolution and faulting in the northern part of the Central Western Carpathians (Spisska Magura and Vychodne Tatry Mts). 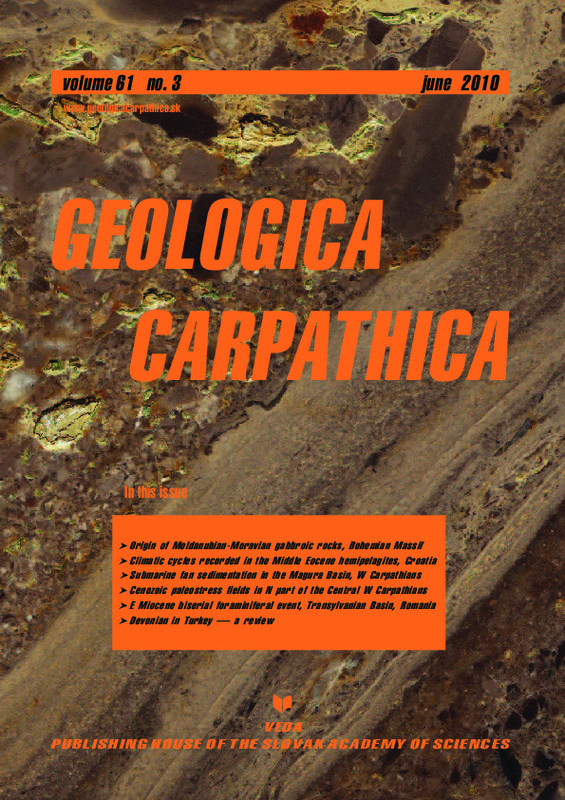 Paleostress analysis of brittle and semibrittle structures of the Eocene–Oligocene succession of the Central Carpathian Paleogene Basin (CCPB) supplemented by measurements in the Triassic sequence of the Krizna Nappe, revealed the existence of six tectonic regimes during the Cenozoic. Orientation of the paleostress field before the deposition of the CCPB was characterized by the E-W oriented compression. After this compression, the paleostress field rotated approximately 40–50°, and NW–SE directed compression took place in the Early Miocene. During the latest Early Miocene, the extensional tectonic regime with fluctuation of s3 orientation between NW-SE to NE-SW dominated. The Late Badenian–Pannonian is characterized by a new compressive to strike-slip tectonic regime during which the principal maximum stress axis s1 progressively rotated from a NW-SE to a NE-SW position. Uplift and tilting of the Tatra Massif took place during this stage. The neotectonic stage (Pliocene to Holocene) is characterized by extensional tectonic regime with the two directions of tension. The first one is oriented in the E-W direction and could be considered older and the second one, NNW-SSE tension is considered to be Late Pliocene to Quaternary in age. In general, orientation of the stress fields shows an apparent clockwise rotation from the Oligocene to Quaternary times. This general clockwise rotation of the Oligocene to Quaternary paleostress fields could be explained by both the effect of the counter-clockwise rotation of the ALCAPA microplate and by the regional stress field changes. Abstract: Investigations of the Lower Miocene of the Transylvanian Basin reveal particularly high abundances (>90 % of total foraminifera) of small sized biserial foraminifera (Bolivina/Streptochilus). This biotic event has not been noticed in the Transylvanian Basin so far probably owing to the facies misinterpretation and the small size of the specimens. SEM investigations allow more precise identification of biserial planktonic taxa and more accurate taxonomic interpretations. The high abundance of Bolivina/Streptochilus assemblages provide evidence for paleogeographic connections to the Indo-Pacific area and support new paleoenvironmental interpretations at the transition from the Early to Middle Miocene in relation to the paleoceanographic events. Both planktonic foraminifera and calcareous nannoplankton suggest a late Burdigalian age. A new Bolivina/Streptochilus Abundance Biozone is proposed just below the Early/Middle Miocene boundary.